Light Up the Night at the Ybor City Pin Chasers Knight Parade This Weekend! Hello all! Jerm here post Valentine&apos;s Day and I hope all of you had a great one with your loved ones and significant others! I hope you are in the mood to play some trivia, cause we have a fun giveaway for you today! It&apos;s that time of year folks, when colorful floats will light up the night in Ybor City Saturday, February 18, when the Krewe of the Knights of Sant’ Yago presents the Pin Chasers Knight Parade, brought to you by Tampa Bay’s MOR and estrellaTV Tampa Bay. This awesome annual parade will begin at 7 p.m. and run along 7th Avenue, from Nuccio Parkway east to 22nd Street. It will last about two hours, after which the shops and restaurants in Ybor City remain open for guests&apos; enjoyment. Free spectator viewing will be available along the parade route, and bleacher seat tickets are available for purchase at www.knightparade.com. One of the best parts of the evening will be the special guests invited! The 2012 grand marshal is Mrs. World, April Lufriu. Special guest of MOR, Jerry Springer, will serve as an honorary grand marshal. I don&apos;t know about you guys, but I will be here for that! 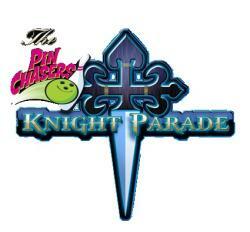 Now we are giving a way four bleacher seat tickets for the Pin Chasers Knight Parade this Saturday in Ybor City! That&apos;s a pretty sweet prize for some luck winner! As awesome as we already are, we are giving one lucky person a chance to win two tickets to this awesome event on Facebook or Twitter! All you have to do is answer some trivia for us and you will be entered in to win our drawing later this evening! Remember, all you have to do is answer correctly the trivia below and you are entered! Keep in mind that for those of you who re-tweet the original post on Twitter, that increases your chances of winning. Same goes if you share the post on Facebook! Enough babbling, here goes! True or False: Grand Marshall April Lufriu is a 42 year old Tampa native with heritage roots from Guanaja, Honduras. True or False: The Krewe of the Knights of Sant&apos; Yago has hosted the Knight Parade every year since 1973, and it is considered the largest of its kind in the Southeast. The Krewe of the Knights of Sant&apos; Yago&apos;s largest fundraiser of the year, a portion of the parade proceeds benefit this foundation, now in its 17th year of existence? Okay folks, get to answering! We&apos;ll announce the winner later this evening!